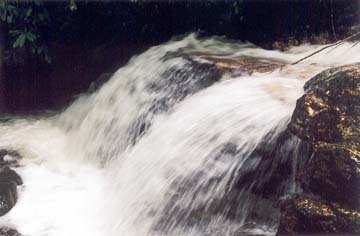 The East Fork of the Chattooga River features a number of cascades and waterfalls as it flows toward the Walhalla Fish Hatchery. 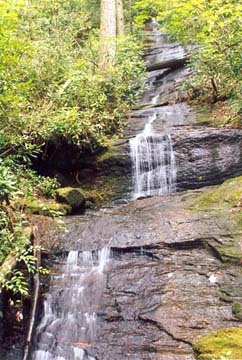 The Foothills Trail follows the East Fork for a stretch, and several falls can be accessed from the trail near the Sloan Bridge trailhead and picnic area. Sloan Bridge is an unsigned parking lot and picnic area on SC 107 just in South Carolina near the SC-NC state line. 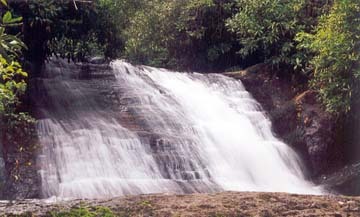 The largest of the falls is Sloan Bridge Falls. You will hear and glimpse this three-tiered drop of 20-25 feet after about .3 mile hike on the Foothills Trail. Descend the very steep bank via one of the pig-paths to view the cascades. The top tier (10-15 feet) is pictured above, and the second tier (5 feet) is below. After .4 mile, you will hear/glimpse another substantial cascade. Again, descend the steep bank to view the 10-foot high Lower Sloan Bridge Falls. Finally, after about .5 mile, you will come to "Hiker's Peril" as named by Ron Tagliapietra in his book "150 South Carolina Waterfalls." You can't miss this 30 foot cascade. In fact, the Foothill Trail used to cross in the middle of this cascade - thus the name. 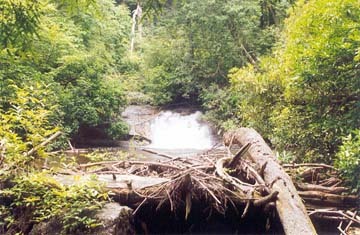 The trail has since been diverted a few feet downstream and crosses this creek on a footbridge. Directions: From Walhalla, take SC 28 north to SC 107. Turn right and follow SC 107 for 16 miles. Sloan Bridge Picnic area will be on the left shortly after Wiggington Road (SR413) turns to the right toward Whitewater Falls. From Cashiers, take NC 107 south for nine miles, cross into SC and look for the parking lot and picnic area on the right. If you reach the lefthand turn for toward Whitewater Falls, you have gone too far. Access the Foothills Trail on the lefthand side of the parking lot. Follow the trail signs toward the Walhalla Fish Hatchery and Oconee State Park.